A 17-year-old male high school wrestler sustained a twisting injury to his right knee during a wrestling match approximately two weeks prior to presentation to our office. Following the injury, he had experienced intermittent pain and popping in his knee. This pain and popping frequently prevented him from taking part in training or competition. Prior to his office visit, he was treating the pain with rest only. At the time of the patient’s visit, he was experiencing pain and a feeling as if his knee was “locked”. A careful examination of the patient’s right knee was performed. During the exam, no physical deformity in the knee was noted, but a small effusion was palpated within the joint. The patient displayed a range of motion (ROM) of 5-125° and the knee was stable when subjected to varus and valgus stress. Lachman and posterior drawer tests were administered, both of which were negative. The patient did not experience any medial tenderness, but tenderness was evident along the lateral joint line. 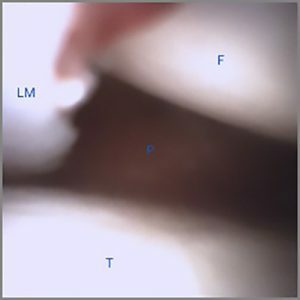 In addition to the lateral tenderness, the patient also demonstrated a positive lateral McMurray test. Following the physical examination, the athlete, his mother and I discussed further diagnostic options for his knee, which included an MRI scan and diagnostic needle arthroscopy using the mi-eye 2™. The risks and benefits of both options were explained to the patient and his mother. A decision was made to proceed with the diagnostic needle arthroscopy using the mi-eye 2™. The mi-eye 2™ procedure was performed in the office at that time. The patient was positioned seated on the edge of the exam table with his legs freely dangling. The right knee was prepared using a standard sterile technique. A total of 15cc of a combination of 1% lidocaine with epinephrine and 0.5%bupivacaine was administered in the anterolateral portal site from the skin down to and through the joint capsule. Adequate time was allowed for the local anesthesia to take effect, at which time the knee was then sterilely re-prepped. A sterile 10cc saline syringe was connected to the luer port of the mi-eye 2™ and was utilized during the procedure. The mi-eye 2™ was introduced through the anterolateral portal of the knee. 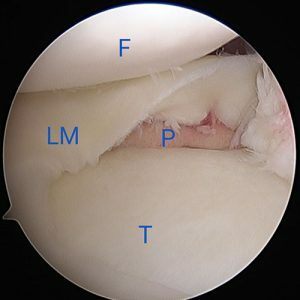 Immediately upon entry into the joint a displaced bucket handle fragment of the torn lateral meniscus was found anterior to the lateral femoral condyle (Fig. 1). 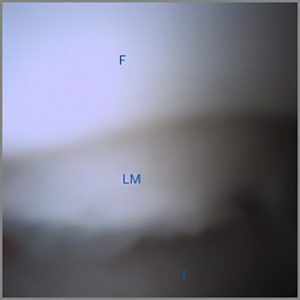 Further investigation revealed the torn body of the lateral meniscus, exposed peripheral rim of the lateral meniscus, and the easily visualized popliteus tendon (Fig. 2 & 3). The findings confirmed the diagnosis of a displaced bucket tear of the lateral meniscus. During the procedure, saline was utilized to assist in the visualization and inspection of the pathology. The saline was subsequently aspirated from the knee via the mi-eye 2™. The mi-eye 2™ was removed and a sterile bandage was applied. The visualization provided by mi-eye 2™ was instrumental in allowing for an immediate diagnosis of this young athlete’s lateral meniscus tear. This immediate diagnosis allowed for him to be scheduled for surgical intervention that week. 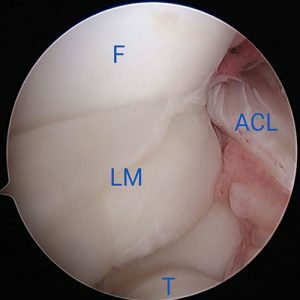 The speed in getting an athlete to surgery is particularly important with displaced bucket handle meniscus tears, as the displaced fragments can become so damaged over time as to not be amenable to repair. It was particularly important for this young athlete, as his knee was locked until the time of surgery. 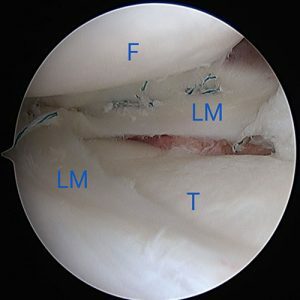 The diagnosis was confirmed during surgery and the meniscus tear was repaired (Fig 4, 5 & 6). The ability to obtain the correct diagnosis immediately by using the mi-eye 2™ spared the athlete and his family excess time of waiting for a diagnosis and prolonging the treatment timeline.